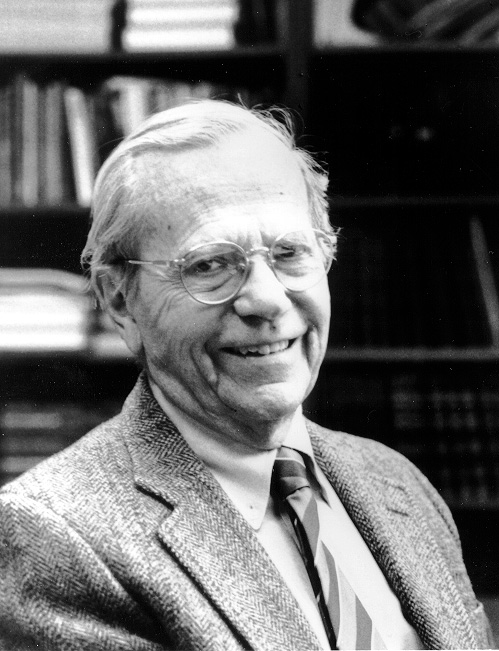 William Trager is a founding member of the Society of Protozoologists and was the first Editor of The Journal of Protozoology (1953-1965). He was President of the Society (1960-1961) and President of the Fifth International Congress of Protozoology (1977). Moreover, he has had a distinguished career in research on parasitological protozoology, publishing more than 200 scientific papers, authoring two books himself, and receiving numerous awards for these contributions. For these reasons, the Society of Protozoologists has established in his honor, the William Trager Award for Outstanding Paper of the Year. Bill Trager was born 20th March 1910 in Newark, New Jersey, the son of Leon and Anna (Emilfork). His parents encouraged scholarly and intellectual pursuits, leading Bill’s older brother George to become a well-known linguist and Bill to distinguish himself in the field of parasitological protozoology. Bill obtained his B.S. from Rutgers University in 1930 and a M.A. from Harvard University in 1931. He pursued doctoral research on termite flagellates under the supervision of Dr. L.R. Cleveland obtaining his Ph.D. from Harvard in 1933. That year, he took a position as a Fellow of the National Research Council at the Rockefeller Institute Department of Animal Pathology in Princeton, New Jersey, in the laboratory of Dr. R.W. Glaser. Here he worked on insect physiology and pathology. In 1934 he was appointed to the staff of the Rockefeller Institute (which became the Rockefeller University in 1953). In 1935, Bill married Ida Sosnow, a partner who was always ready to share in the fun of scientific outings, whether it was collecting diseased caterpillars in Vermont, teaching in Bangkok, or keeping house in Nigeria. Bill and Ida instilled the love of life and accomplishment in their three children: son Les is a successful attorney in New York City; daughter Carolyn worked as a biologist in Vancouver, B.C., where her husband is a biophysics professor, and daughter Lillian is a professor of anthropology at the University of Wisconsin, Parkside. Bill remained at Rockefeller but moved to New York in 1950 when the Rockefeller labortories at Princeton were closed. He became Professor and Head of the Laboratory of Parasitology from 1964-1980 and Professor Emeritus from 1980 until the present. Bill’s principal research contributions to parasitology span three broad areas: insect physiology, host-parasite relationships; and the physiology of the erythrocytic stages of malaria parasites. He made groundbreaking contributions in the cultivation of insects, developing the first bacteria-free culture system for mosquito larvae. This lead to a series of papers beginning in 1935 to determine larval nutritional requirements. Bill developed culture methods for silkworm, mosquito and tsetse fly tissues, enabling the propagation of polyhedral virus in the silk worm tissues and Western equine encephalitis in mosquito tissue, and of Trypanosoma vivax in the tsetse tissue. His interest in exploring host-parasite relationships led to the discovery of acquired immunity to ixodid ticks in 1939. His initial research with bird malaria convinced him of the importance of devising culture methods for Plasmodium to permit a fuller understanding of its physiological requirements. In 1950, using erythrocyte extracts, Bill successfully devised an in vitro extracellular cultivation protocol for avian Plasmodium. This enabled demonstration of the parasite’s dependence on the host erythrocyte for ATP and coenzyme A. A breakthrough in the parasite physiology research occurred in the mid-1970s, when Trager and Jensen achieved continuous cultivation of the human malaria parasite Plasmodium falciparum. This opened the way for research to develop vaccines against malaria and to control conditions for exploring the physiology, biochemistry and immunology of the parasite. Clones of P. falciparum were isolated and maintained, facilitating research on its genetics and molecular biology. These studies led in the 1990s to the successful extracellular (axenic) development in vitro of the erythrocytic cycle of P. falciparum. Bill has published over 210 scientific papers and authored two books, Symbiosis (1970) and Living Together: The Biology of Animal Parasitism (1986). In addition to editing Molecular Biology of Parasites (1983), he was the first Editor of The Journal of Protozoology (1953-1965). Bill would read papers submitted to the journal on his daily train commute from Scarsdale to New York City. He used to tell colleagues that if he could not finish a paper on the 35-minute train ride, it was probably too long! Bill’s outstanding discoveries and prolific contributions have earned him numerous and prestigious awards. He was elected to the National Academy of Sciences USA (1973) and selected as a Guggenheim Foundation Fellow (1973-1974). He was honored with the Sc.D. by his Alma Mater, Rutgers University (1965), and the Rockefeller University (1987). Some of the awards Bill has received include the Fifteenth S. T. Darling Medal and Award in Malariology by the World Health Organization (1980), the Leuckart Medal by the Deutsche Gesellschaft für Parasitologie (1982), the First Rameshwardas Birla International Award in Tropical Medicine (1982), the Manson Medal by the Royal Society of Tropical Medicine and Hygiene (1986), the Augustine Le Prince Medal by the American Society for Tropical Medicine and Hygiene (1991), and the Prince Mahidol Award in Medical Science in Bangkok, Thailand (1994-1995). While firmly committed to his research, Bill has also found time to support the many scientific societies of which he has been a member. In addition to serving the Society of Protozoologists as Editor and President, Bill has been a Councillor (1956-1957), Vice-President (1968-1969), and President (1973-1974) of the American Society of Parasitologists and President (1978-1979) of the American Society of Tropical Medicine and Hygiene. He has served in an advisory capacity for the World Health Organization, the National Institute of Allergy and Infectious Diseases, and the Armed Forces of the United States, for which he also served as a Captain in the Sanitary Corps, doing malaria research in the southwest Pacific (1943-1945). Denis H. Lynn, January 2002.